NEWARK, N.J. (CN) – A federal judge handed a sentence of one year home confinement Monday to a former appointee of Gov. Chris Christie at the heart of a pay-to-play scheme. David Samson, the former chairman of the scandal-plagued Port Authority of New York and New Jersey, cited his declining health and cooperation with prosecutors in seeking leniency. In addition to probation and community service, U.S District Judge Jose Linares ordered the 77-year-old to pay a penalty of $100,000. At his guilty plea in July, Samson admitted to abusing his public office as leverage for United Airlines travel perks. In exchange for Samson ensuring that the Port Authority approved United’s plans for a larger hangar at Newark Liberty International Airport, the airline agreed to reinstate a money-losing flight from Newark to Columbia Metropolitan Airport. Samson had a vacation home just a few dozen miles from the airport in Columbia, South Carolina. The “Chairman’s Flight” and “Samson Air,” as Samson and a lobbyist dubbed it, even accommodated Samson’s personal itinerary, departing Thursday nights and returning early Monday mornings. U.S. Attorney Paul Fishman remarked on the irony after the hearing that Samson will be spending his year of house arrest in South Carolina as he longer has a New Jersey residence. Samson declined to apologize for his actions as he left the courthouse to a waiting car. United stopped the “Chairman’s flight” in 2014, shortly after Samson resigned from the Port Authority. By that time, Samson had used the flight more than two dozen times, and the scandal known as Bridgegate had cast its shadow over New Jersey’s political scene. Though never charged with the conspiracy himself, Samson’s name came up repeatedly in the Bridgegate trial last year, which ended in the convictions of Christie’s former deputy chief of staff, Bridget Ann Kelly, and his top appointee to the Port Authority, Bill Baroni Jr. Together with another Port Authority official, David Wildstein, Baroni and Kelly conspired during Christie’s 2013 re-election to exact retribution against one of the Republican governor’s political enemies. After Fort Lee Mayor Mark Sokolich declined to endorse Christie, the Democrat’s city lost two of its three reserved for its access to the George Washington Bridge. The lane closures snarled commuters, school buses and emergency vehicles for four days in gridlock traffic. Samson previously served as New Jersey attorney general from 2002 to 2003 and was a key adviser to Christie when he ran for governor in 2009. Federal investigators got wind of his dealings with United while examining emails as part of the Bridgegate investigation. In one damaging email that came to light from the Bridgegate scandal, Wildstein wrote that Samson was “helping us retaliate” against Patrick Foye, the New York-appointed executive director of the Port Authority who used an executive order to reopen Fort Lee’s lanes. 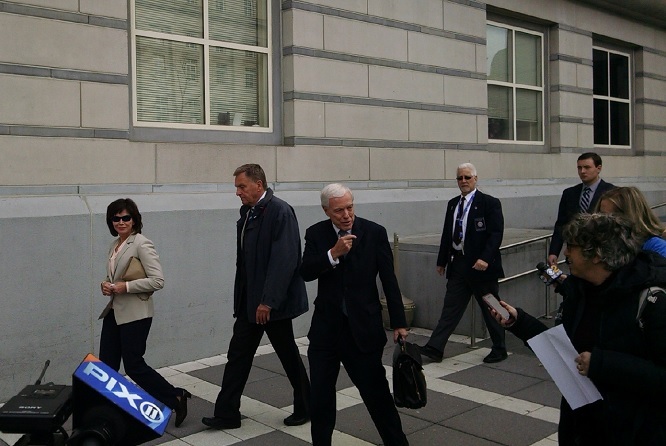 Ahead of Samson’s sentencing this afternoon, a number of friends and confidantes, including former New Jersey Gov. Jim McGreevey, wrote letters urging leniency. Roughly one-third of the crowd that turned up for Samson’s appearence were turned away from the crowded courtroom. When apologized to his family on the stand, Samson reportedly shook visibly. This is said to be a symptom of his medical condition. U.S. Attorney Fishman noted that prosecutors are disappointed that they did not get the two-year prison sentence they sought. They will not be appealing, per the terms of Samson’s plea deal. The chairman’s flight got off the ground after Samson had dinner with United lobbyist Jamie Fox in New York City. Fox, who died last month, served as New Jersey Transportation Commissioner from 2014 until 2015. He was under investigation by federal officials for allegations of corruption involving Atlantic City. Several United executives, including CEO Jeff Smisek, ultimately left the company as a result of the Newark-Columbia flight plan. The airline agreed to pay $2.25 million penalty and to revamp its compliance programs to more easily detect bribery. United will not face any charges if it abides by the terms of its new compliance program. Sentencing for the Bridgegate co-conspirators is scheduled for later this month. Samson former law firm, Wolff & Samson, was known for its close ties to New Jersey government officials, mainly due to Samson’s own contacts throughout the years. The firm today is known as Chiesa, Shahinian & Giantomasi.